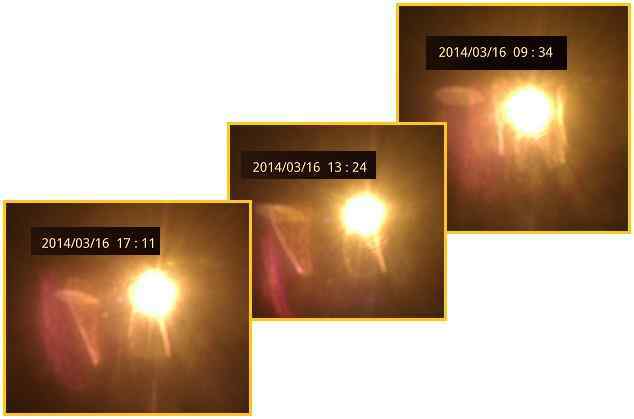 Alberto’s amazing ability to capture the Planet X components on film stems from applying the Zetas advice, given in 2003, to filter for light in the red spectrum. It is not just filtering out the glare of the Sun, though this is important. Filtering for the red light spectrum picks up light filtering through the vast dust cloud shrouding Planet X, aka Nibiru, which is composed of iron oxide – a blood red color – thus the red dust falling prior to a passage in Revelations and of legend. One of the first visible signs of this encounter was the reddening of the earth’s surface by a fine dust of rusty pigment. In sea, lake, and river this pigment gave a bloody coloring to the water. Because of these particles of ferruginous or other soluble pigment, the world turned red. The Manuscript Quiche of the Mayas tells that in the Western Hemisphere, in the days of a great cataclysm, when the earth quaked and the sun’s motion was interrupted, the water in the rivers turned to blood. Ipuwer, the Egyptian eyewitness to the catastrophe, wrote his lament on papyrus, “The river is blood”, and this corresponds with the Book of Exodus 7:20: “All the waters that were in the river were turned to blood”. 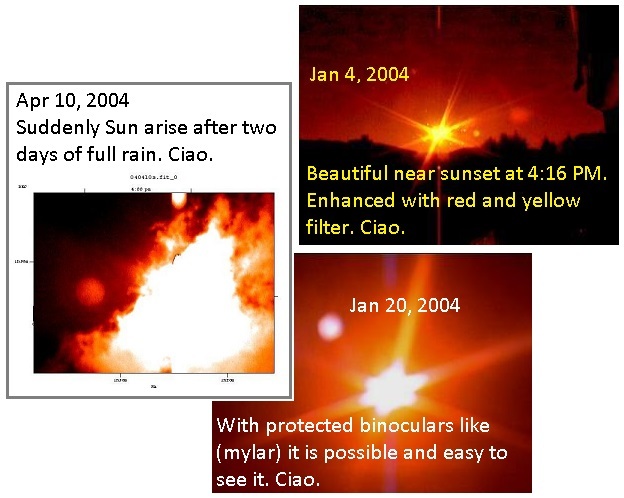 ZetaTalk Advice 2001: When comparing the Magnitude of objects that can be viewed from Earth, our intent in the general-public statement made in 1995, we considered all visible light. The IRAS team went looking for Planet X in the early 1980's with infra-red because they understood that the spectrum was almost exclusively red. Should your equipment be calibrated to give an almost exclusively red object the same advantage that the predominant light spectrum from starlight gets, you'd see it. Alberto is an amateur astronomer, and provided photos of the incoming Planet X complex in 2003. He applied the ZetaTalk advice to tune the camera to light in the red spectrum, and has become the world expert on this technique. As the Planet X complex comes closer, Alberto’s photos have become more dramatic. On March 14, 2014 Alberto captured a breathtaking capture of a String of Pearls lineup of the Moon Swirls. ZetaTalk Comment 3/22/2014: Alberto’s photos have recently displayed a dramatic String of Pearls. Two days later his photos displayed an odd ellipsoid shaped cloud in the vast tail of Planet X wafting across the face of the Sun. Why has this changed? The String of Pearls formation is visible because it is a series of Moon Swirl tubes turned so that their ends face the Earth. Each captures sunlight at the end pointed toward the Sun, intensifies this when the sunlight bounces down the tube, and emerges at the end facing the Earth as bright light, focused like a flashlight. When the dynamics in the tail change such that the String of Pearls formation points off to the side, no longer toward the Earth, all the dust and debris and moons in the swirls is now a cluster seen from the side. Thus, the ellipsoid. The planned announcement admitting the near presence of Planet X, aka Nibiru, has been fraught with frantic attempts by the cover-up crowd to disrupt, delay, and prevent this admission from happening. ZetaTalk Overview 8/17/2013: Last May, 2013 we reminded the public of the many attempts Obama made in the Fall of 2012, all of which were blocked by the cover-up crowd who did not allow the EAS system or a broadcast from the Oval Office to occur. Obama then began a campaign to identify and incapacitate those in the federal government who were thwarting him on the announcement, and over many months notables like General Petraeus, General Allen, and the second in command at the CIA, Michael Morell were dismissed. Imagine the fallout in lesser positions. Meanwhile numerous assassination attempts were made. Diesel was put into Obama’s car in Israel, to force a roadside transfer open to a sniper. Poisoned tableware at a Republican luncheon was attempted. A fire in the West Wing of the White House. A Santa Monica shooting rampage as a diversion during Obama’s visit. And these are only the attempts known to the public. The cover-up crowd wanted the public kept dumb, in the dark, until the last minute, so the elite would not have to deal with their panic. To catch those determined to prevent the announcement, bait and switch has been employed. ZetaTalk Comment 3/22/2014: We have repeatedly referring to the game the announcement team has been forced to play as bait and switch. What does this mean? It means putting out false dates, and providing lots of action that indicates the false date is a real date, and then when the cover-up crowd tries to create mayhem to prevent the announcement, catching the culprits. This has happened dozens of times during the past year and a half since Obama determined to admit the presence of Nibiru. 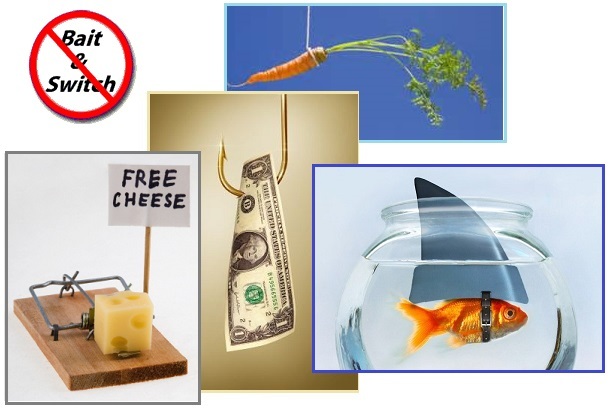 Most bait and switch traps have no public flags, but they are equally important. A recent public flag that a bait and switch operation was in process was the Courtney Brown episode, wherein he claimed an important announcement was to occur in February, 2014 and that some of the announcement would be delivered by his hand. No mention was made of the ZetaTalk statements on the announcement, in place since June, 2012. Courtney, and Courtney alone, was at the center and in the know, such was his claim. Then Courtney pushed the date to mid-March, to the Ides of March on March 15, all the while claiming he was the center of the Universe. More on the timing of the announcement. There is still a lot of activity behind the scenes, including disagreement, angry emails, wonder, amazement, international phone calls, you name it, it is there. The announcement will happen this month, but I still do not have an exact date. From the very beginning, the anticipated date of the announcement was 28 February 2014. But there were some uncertainties due to the international nature of the issues involved, so we held off releasing the date. After lots of discussion with people all over the world who are involved one way or another, we are now expecting the announcement to happen in mid-March, about two weeks later than originally anticipated. Again, nothing can stop the announcement. But this announcement can happen only once, and it has to be done correctly. Given the amount of coordination involved, mid-March 2014 seems to be optimal. Just a reminder. Now is a good time to sign up for the free Farsight Newsletter. We will be putting up a lot of information on it related to the announcement mentioned often below. Some of the information will be available only on the newsletter. I have an update on the timing of the major announcement. In one week, I will know the exact date of the announcement in mid-March. As soon as I know, I will initiate a daily countdown to end on the day of the announcement. The countdown is not a gimmick, but rather it is just to give everyone a clear picture of exactly when the announcement will happen, and one week's notice will be useful. This will prevent people from being surprised or caught off-guard when it actually does happen. The countdown will begin in about a week. Courtney and his CIA handlers were caught in a bait and switch, and the false date they were counting on was one spread in part by myself, Nancy, and the Zetas via ZetaTalk. ZetaTalk Bait 2/8/2014: Nancy and the Pole Shift ning moderators were informed in December that this would be the date, “mid Winter and after the Holidays”, which was stated in vague enough terms that it could not be pinned down. 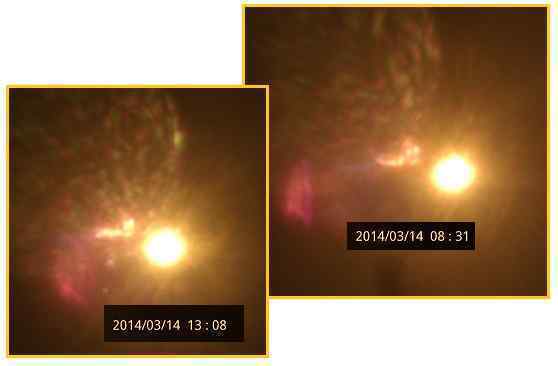 Listen to Nancy’s MUFON interview from December 13, 2013 for proof of this. The CIA is very much in the know, and hoping to boost Courtney’s book sales and Institute activities, so leaked the date to him. ZetaTalk Bait 2/22/2014: They decided since they couldn’t just eliminate Courtney Brown that he would instead miss the mark by far. In this statement we are not giving you the date. To miss the mark by far going into the future is the one certain way to do that. Now the Ides of March has come and gone, and still, no announcement. The star of the Farsight institute was forced to state that his announcement was nothing more than a series of videos (for sale, of course) on the pyramids. There are three components to this announcement, arguably the most important announcement in recent years. The first is called Farsight Planet 2014, and it is found in a video just released on YouTube. It is also found on the home page of The Farsight Institute. The larger documentary is $12 to rent or $15 to purchase as a video-on-demand, and that is what people who want to see all the video data will want to watch. There is no way to show people that except on video. The goal of all of this is to change the way the entire world thinks. Where this was the public face of yet another bait and switch operation, the Zetas caution that we are only seeing the tip of the iceberg. More culprits were caught, behind the scenes, and those anxious to have the announcement occur should keep in mind the real goal, that the announcement manage to occur at all despite all the opposition. ZetaTalk Comment 3/22/2014: For those impatient to have the announcement happen, impatient to have proof to convince family and friends that planning for a survival camp in a safe location must be given priority, we say that their first item of concern should be that the announcement happen at all! If bait and switch requires that Nancy truly believe the date is at hand, or even that official ZetaTalk hint at that, then that’s what will be provided. Or should you, like a child, feel that your impatience is all that matters. 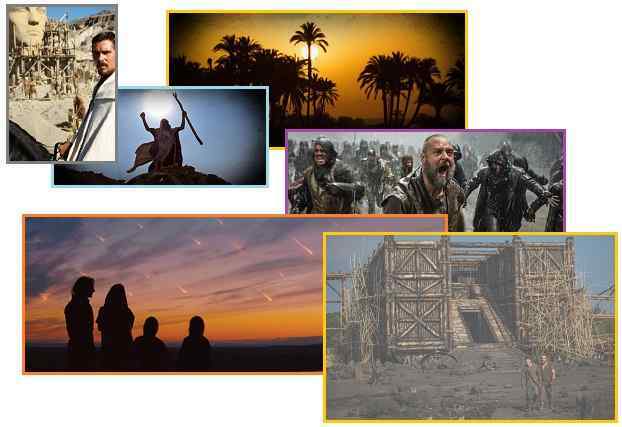 Two new movies will premiere in 2014, both relating to the pending passage of Planet X, aka Nibiru. Noah is due to be released in April, and the Exodus in December. Per the Zetas, that this coincides with the announcement admitting the pending passage of Nibiru is no accident. ZetaTalk Comment 3/22/2014: The story of Noah and the Exodus are both Biblical stories, though the Egyptian historical records in the Kolbrin also include them, and include more detail and accuracy. The Bible has been altered, portions that offended leadership omitted, where the Egyptians stuck to the facts. That both these movies are emerging in 2014, the year the announcement admitting the pending passage of Nibiru is anticipated, is not an accident. Many have already become suspicious that the End Times have arrived based on droughts, dead fish and birds, signs in the skies, and a perceived increased in the battle between good and evil. The Bible is expected to become a virtual reference manual by many following the announcement, and the stories of Noah and the Exodus are clear examples of prior passages. The Book of Revelations also has a parallel in the Kolbrin, in describing the forthcoming passage. Beyond wanting to make a profit in the movie making business, the promoters of these two 2014 films hope to educate the public. Noah planned for flooding in a practical manner, building a water tight boat for his family and livestock. The message of the Exodus is that the good hearted will be assisted, while those intent on enslaving others will not. 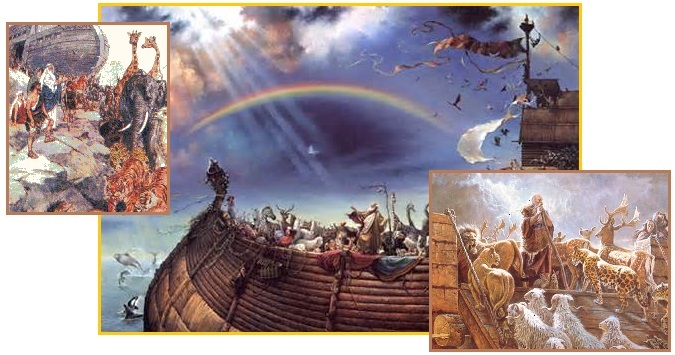 The Kolbrin report on Noah differs somewhat from the Biblical report, and is more logical. For instance, Noah does not rescue every creature on Earth, but focuses on domestic animals his family will need after the flood subsides. Noah is pictured as a nobleman, with enough wealth to build the Arc. The Kolbrin describes the Flood on page 128. The Earth wobble that precedes a Pole Shift is clearly described. They had knowledge of … signs and omens, the secrets of the seasons, of the moon and the coming of the waters. ... there were wise men filled with the inner wisdom, who read The Book of Heaven with understanding and knew the signs. … Then the day came when The Lady of the Night changed her garment for one of a different hue, and her form swept more swiftly across the skies. Her tresses streamed out behind in gold and copper, and she rode in a chariot of fire. … the hour of trial draws nigh. … It has been told to me in a dream that the ship should be built against the mountains, and the sea will come up to me. … The lowermost was for the beasts and cattle and their provender, and it was laid over with sand from the river. The middle one was for birds and fowls, for plants of every kind that are good for man and beast, and the uppermost one was for the people. … cisterns for water and storehouses for food … the ship was without mast or oars. There were no poles and no openings, except for a hatch beneath the eaves above whereby all things entered. Into the great ship they carried the seed of all living things; grain was laid up in baskets and many cattle and sheep were slain for meat which was smoked by fire. They also took all kinds of beasts of the field and wild beasts, birds and fowls, all things that crawl. They said to the mockers, "Have your hour, for ours will surely come". Then, with the dawning, men saw an awesome sight. There, riding on a great black rolling cloud came the Destroyer, newly released from the confines of the sky vaults, and she raged about the Heavens, for it was her day of judgement. The beast with her opened its mouth and belched froth fire and hot stones and a vile smoke. It covered the whole sky above and the meeting place of Earth and Heaven could no longer be seen. In the evening the places of the stars were changed, they rolled across the sky to new stations, then the floodwaters came. … The floodgates of Heaven were opened and the foundations of Earth were broken apart. The surrounding waters poured over the land and broke upon the mountains. … storms and whirlwinds were loosed. … There was a time of great heat, then came a time of bitter cold. The waves over the waters did not rise and fall but seethed and swirled. … The stars in the Heavens were loosened from their places, so they dashed about in confusion. There was a revolt on high, a new ruler appeared there and swept across the sky in majesty. … The Destroyer passed away into the fastness of Heaven and the great flood remained seven days, diminishing day by day as the waters drained away to their places. 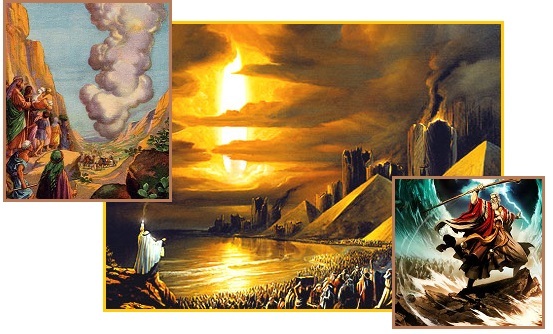 Where the Bible casts the Exodus setting as a battle between the righteous Jews and an evil Pharaoh, the Zetas describe Moses as being an opportunist who took advantage of the passage of Nibiru to escape across the Red Sea, though Moses was assisted. The Kolbrin describes the Exodus on page 641. The Doomshape, called the Destroyer, in Egypt, was seen in all the lands, thereabouts. In color, it was bright and fiery, in appearance changing and unstable. It twisted about itself like a coil … It was not a great comet or a loosened star, being more like a fiery body of flame. Its movements on high were slow, below it swirled in the manner of smoke and it remained close to the sun, whose face it hid. There was a bloody redness about it, which changed as it passed along its course. It caused death and destruction in its rising and setting. It swept the Earth with grey cinder rain and caused many plagues, hunger and other evils. It bit the skin of men and beast until they became mottled with sores. In the glow of the Destroyer the Earth was filled with redness. The face of the land was battered and devastated by a hail of stones which smashed down all that stood in the path of the torrent. They swept down in hot showers, and strange flowing fire ran along the ground in their wake. The fish of the river died; worms, insects and reptiles sprang up from the Earth. The gloom of a long night spread a dark mantle of blackness which extinguished every ray of light. None knew when it was day and when it was night, for the sun cast no shadow. The darkness was not the clean blackness of night, but a thick darkness in which the breath of men was stopped in their throats. Men gasped in a hot cloud of vapour which enveloped all the land and snuffed out all lamps and fires. … Ships were sucked away from their moorings and destroyed in great whirlpools. It was a time of undoing. ZetaTalk Insight 11/15/1996: The last passage of Planet X is best remembered as the time of the Jewish exodus from Egypt, but what is not well known is the reason for the exodus. The Jewish exodus did not occur because this large group just decided to take a stroll one day, anticipating nothing worse than a whipping as the comeuppance should they be discovered. The exodus occurred because their masters were devastated and distracted by problems so severe as to take their minds entirely off their slaves. Would this have been a flooded Nile or a plague of locusts or even celebration where all got drunk? Nothing in the normal course of Egyptian society would have created a situation where the Jews could have left, en mass, or even a situation where they all would have had the courage to leave. They left because the passage of Planet X imposed first a long night and then horrendous earthquakes and volcanic eruptions in nearby volcanoes.